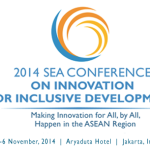 “The 2014 Southeast Asia Conference on Innovation for Inclusive Development: Making Innovation for All, By All Happen in the ASEAN was held in Jakarta, Indonesia on November 5 – 6, 2014. The UNIID-SEA — the pioneering network of innovation for inclusive development (IID) scholars, instructors, researchers, development professionals, and local community partners in Southeast Asia — was publicly launched in this international conference. The network and the conference are the fruits of a two-phase regional initiative supported by IDRC since 2008 which promoted and piloted interdisciplinary research and learning programs on base-of-the-pyramid (BoP) technologies and inclusive innovation. Currently at the forefront of this network are the Ateneo School of Government and the National Research Council of the Philippines, together with partner units and programs in the Ateneo de Manila University, Chulalongkorn University, University of Malaya, Institut Pertanian Bogor, Institut Teknologi Bandung, Hoa Sen University, National Research Council of Thailand, Dewan Riset Nasional of Indonesia, and National Council for S&T Policy of Vietnam”. * By Mary Grace Santos, UNIID-SEA.